Jake is a tough but nervous old cat who was homeless in my parents' neighbourhood for a couple of years before he warmed up to them and they took him in. He is an unlikely lap cat -- desperate for love but too tough to admit to wanting to cuddle up. But the year we lived with my parents, he would often worm his way into the warm lap of one of my girls while they sat reading for hours on end. 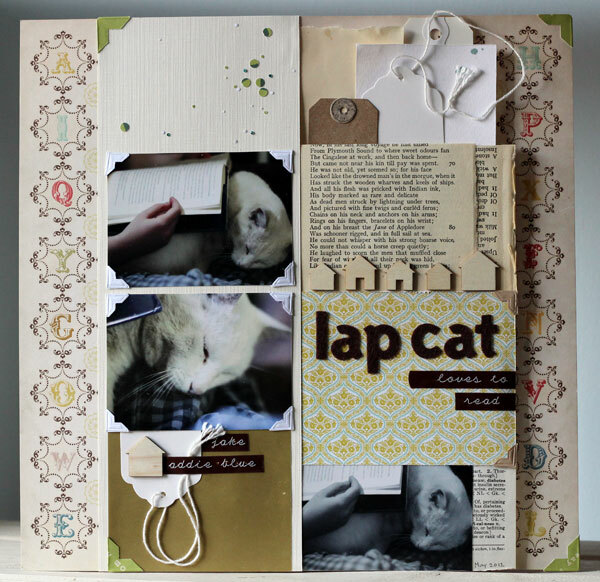 This layout was inspired by a 2Peas Summer CHA Social layout challenge sketch. 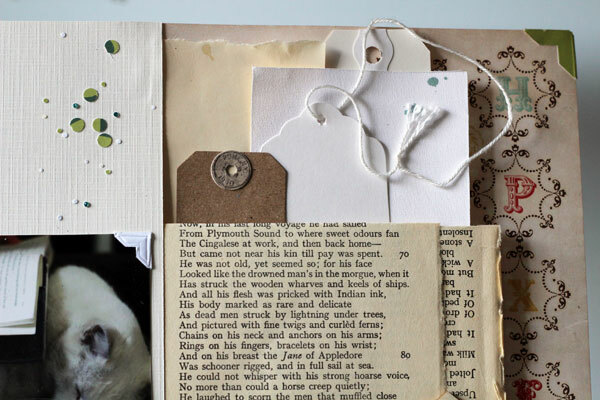 I took the idea of the rows of boxes and moved them into towards the centre of the page. These brown felt Thickers were perfect! Knew as soon as I started with these photos that I'd use these letter stickers. I've been loving those wood veneer houses from Studio Calico! They are one of those products that sat around for a while, but once I got the first piece on that first layout, I kept reaching for them for many of my following layouts. So cute! 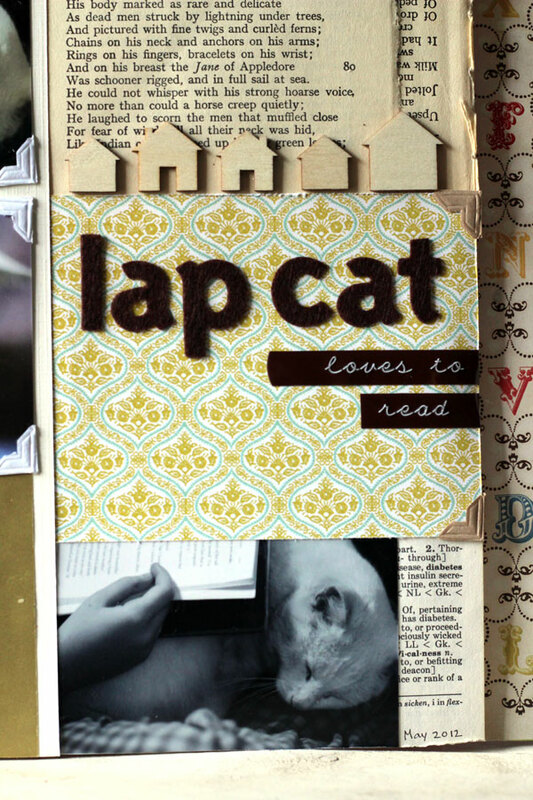 I grabbed a random handful of tags and scraps from my little scrap box on my desk and arranged in the top quadrant of the page. The green confetti pieces (and the photo corners) were all punched from the cut-off strip of the patterned paper in the background. Feels like a "free" supply when I use up all the little bits from a sheet of paper, including what is usually intended for the recycling bin! 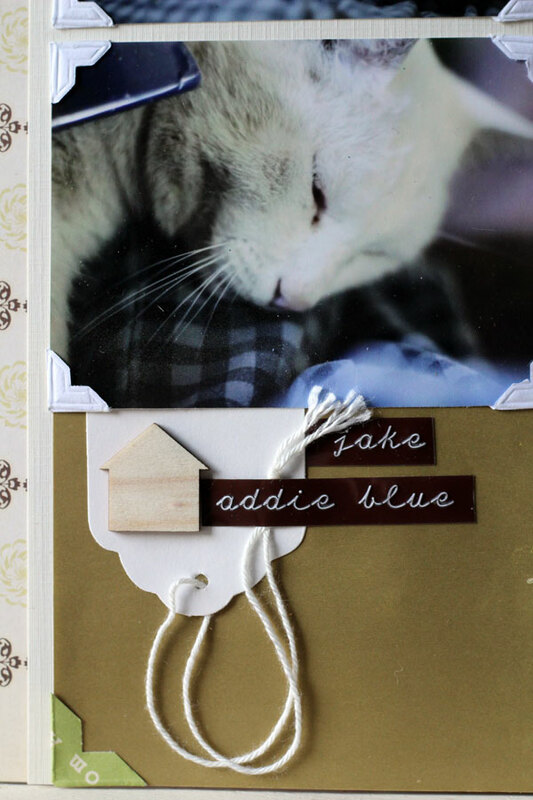 Supplies: patterned paper (Cosmo Cricket, Studio Calico); tags (Avery, the Paper Company); letter stickers (American Crafts); photo corners (Canson); wood veneer (Studio Calico); pen (Sakura); punches (Martha Stewart, Fiskars). The LO turned out great! You do great layering! I so love your style! P.S. You should totally apply for the JBS DT!